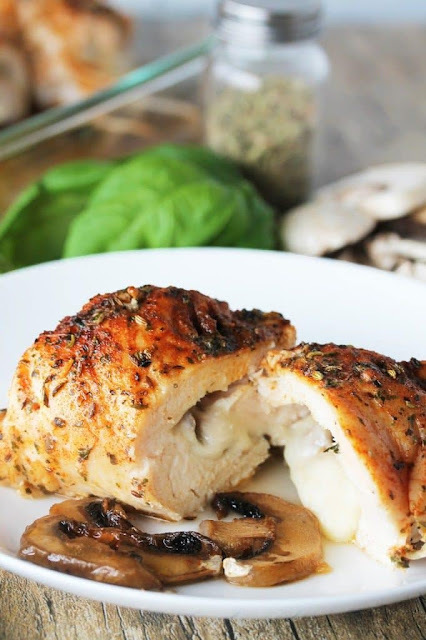 Chicken breasts stuffed with mushrooms and cheese and rubbed with a special mixture of herbs. 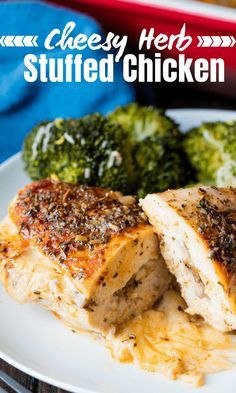 These Cheesy Herb Stuffed Chicken Breasts will wow you! Use a meat tenderizer to pound out the chicken breasts until about ¼-inch thick. Place a pinch of cheese in the center of each chicken breast. Top with sliced mushrooms. Finish off with another pinch of cheese. Carefully roll up the chicken so mushrooms are completely inside. Secure the edges with toothpicks. Place in the prepared pan. In a small bowl, mix together basil, oregano, paprika, caraway, fennel, white pepper, and onion powder. Sprinkle generously over each chicken breast. Place a tablespoon of butter on top of each chicken breast. Bake in the preheated oven until chicken is cooked through to an internal temperature of 165 degrees, about 30-40 minutes. 0 Response to "CHEESY HERB STUFFED CHICKEN"